I have been fascinated with mobile wallets for a while (note 4). They’ve been “just a few years out” since the first Finovate (Oct 2007), where multiple mobile banking pioneers laid out their product roadmaps. And now we are starting to see real implementations. Not just Square and Starbucks. But financial institutions are moving forward. 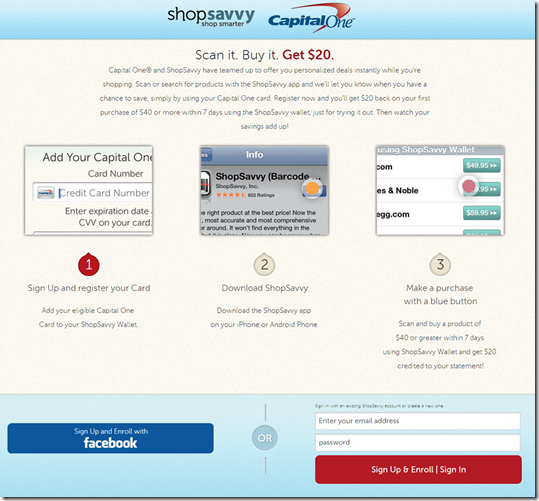 The latest rollout, the Capital One and ShopSavvy deal, was announced last month (press release). Capital One has already partnered with several major card-linked offers providers (and acquired one), but apparently it is still looking to boost its mobile efforts (note 1). 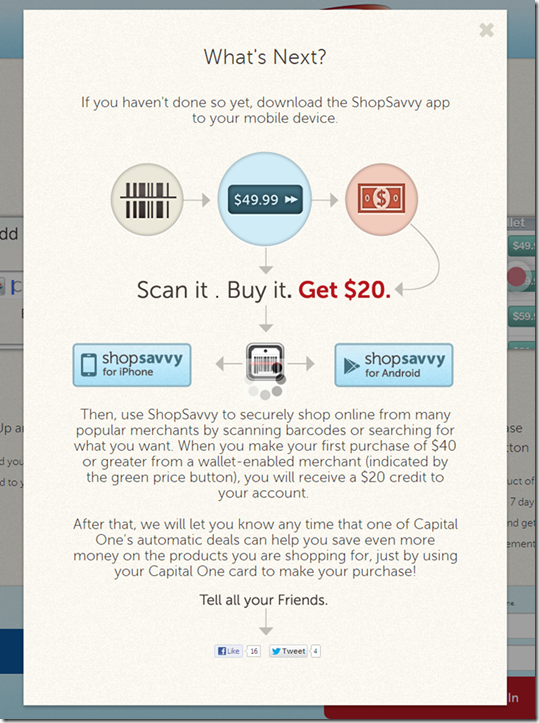 ShopSavvy is a San Francisco-based startup which has built a mobile wallet, shopping and deals apps. It has raised $11 million, two-thirds from Facebook co-founder Eduardo Saverin. The company has integrations with a number of online merchants including Walmart, Barnes & Noble, Overstock.com, Target, Best Buy and others (note 2). 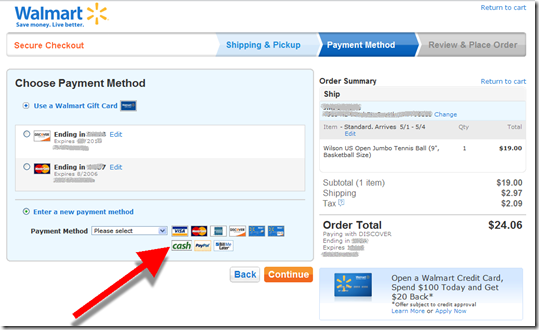 Those links allow users find online prices, either by scanning a bar code in-store or in-app search, then purchase online with a single slide (see inset). 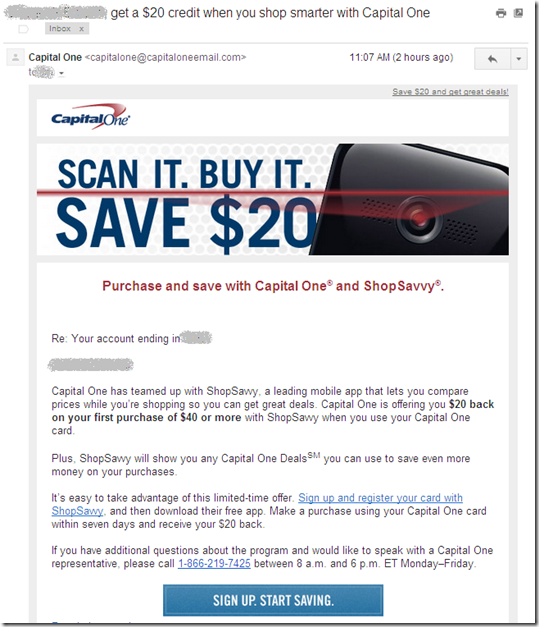 I got the invite from Capital One Wednesday morning with an eye-catching $20-off offer (see first screenshot below). But this wasn’t like a straightforward card-linked offer where cardholders activate the deal and then buy. 1. 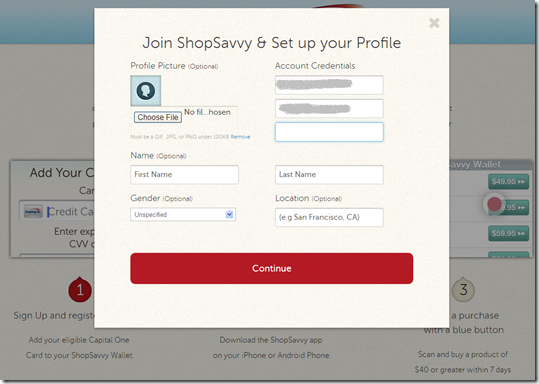 Sign up for an account at ShopSavvy using the link in the email. It’s a relatively painless process, taking just a minute or two. None of my personal info was prepopulated (see screenshot #3-5 below). 2. Add the app to your mobile phone by locating the ShopSavvy app in the App store, downloading and opening. 3. 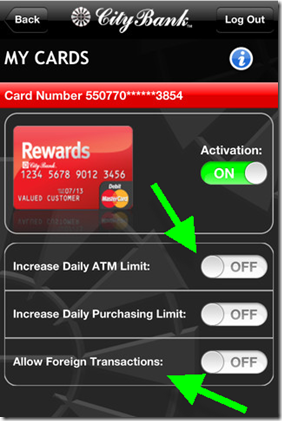 Activate the ShopSavvy app by entering your username and password and repeating the info you’d entered online to set up your profile. Altogether, it’s a somewhat convoluted 5- to 6-minute process, but one that is probably acceptable for early adopters. I did have intermittent problems with the app, network errors, crashes and bizarre search results (note 3). But it seems to have stabilized now after the initial usage spike. Bottom line: Once it started working properly, the ShopSavvy features were impressive. 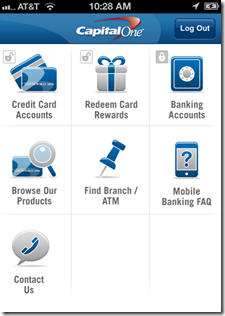 The simple search combined with one-click purchasing would make a nice addition to a bank or card issuer’s mobile app. 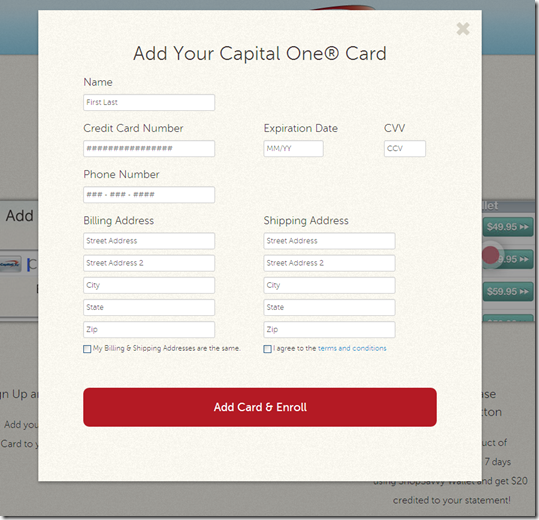 I’m still a little surprised that Capital One is endorsing a third-party wallet. But by getting its card “top of e-wallet,” the giant issuer boosts charge volume, mobilizes its card-linked offers, and gets a foothold in the wallet space. 1. Or perhaps this is more of a straight revenue-play for Capital One, with ShopSavvy paying the card issuer for each new customer. 2. Unfortunately, ShopSavvy’s one-click experience does not extend to Amazon.com, but the app does display Amazon prices and it’s just a few more clicks to buy there. 3. Initially, I tried the app with a few barcodes I found at home and it worked, but only on the media stuff. Since I didn’t want to buy anything I already owned, I went to the last remaining bookstore in northeast Seattle and gave it a try. Unfortunately, this store covers the regular barcode with its own, which are not indexed in the ShopSavvy database. But when I tried it again last night, the search function was working so I was able to easily find a DVD set and buy it from Target.com for a competitive price (even before the $20 statement credit). Transactional banking is fairly straightforward. There are electronic payments, ATM withdrawals, debit card payments, credit card charges, and checks. When a technology comes along that offers to combine three of those in a familiar form factor (plastic card), you would think it would catch quickly. But combined credit/debit cards have not gained much of a following yet. With one big exception: Fifth Third Bank. 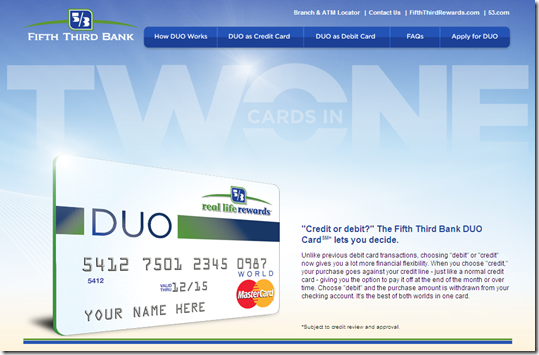 In 2011, the Cincinnati-based bank, the 15th largest U.S. retail bank with $120 billion in assets, launched a combined credit/debit card called DUO. 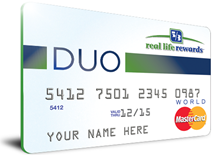 According to American Banker this week, “(DUO) has recently accounted for about 25% of new credit card accounts” at the bank. My take: That may or may not be a large number depending on the bank’s overall card marketing efforts, but it’s a good indication that there is at least some consumer demand for the so-called hybrid card. Personally, I stopped carrying an ATM card years ago, so I would love having ATM access added to the credit cards I tote around. I would even pay a modest fee for the convenience (note 2). True, the mobile wallet holds the promise of combining everything into one grand app. However, it’s a long, long road to mass adoption. Seventeen years into online banking, it’s still used regularly at less than 60% of U.S. households (note 3). So bring on the hybrid cards, but make sure there is also a killer mobile app supporting them. 1. It’s been 17 years since Web access was first launched by Wells Fargo (May 1995). Dial-up online banking predates that by more than a decade, but it was used by such a small group that it doesn’t really rate a mention. 2. “Modest” would be in the $1/mo neighborhood, unless there more features were added. 3. Source is our annual forecast (subscription, Jan 2012) which we are in the process of updating and will be available in a few days. The inspiration for today’s installment is from The Financial Brand which wrote about a new app from branch automation provider, Better Branches. 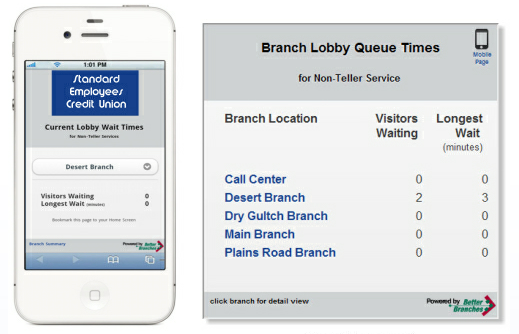 The widget shows the real-time queue at various branches so customers can better time their visit. The company offers a mobile and online version (screenshot below; see note 1). What is much more helpful for most online/mobile customers is call-center wait times, something Ally Bank positions clearly on its homepage and recently launched in its mobile app. Note: No financial institution users were cited in the article. But according to a comment left by Brett King, of Bank 2.0 fame, RBS offers this feature in the UK. 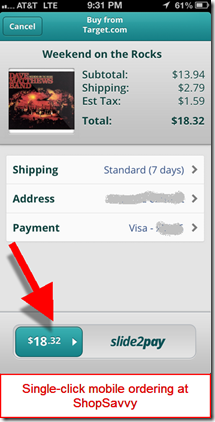 One of my favorite features unveiled last week, was Universal Checkbook from Personal Capital. And apparently I wasn’t the only one. Attendees voted the startup Best of Show (again) and hit Twitter with positive comments such as the one below from Brad Leimer (@leimer) of Mechanics Bank,. Universal Checkbook (see inset) allows users to move money directly between any linked bank/brokerage accounts, providing they have check-writing capabilities. While many banks also support interbank transfers, they usually require funds to move in and out of the host bank account. To move money between two third-party accounts requires two separate transfers. And it would take 5 or 6 days (via U.S. ACH system) if you waited for the funds to arrive in the host account before sending them elsewhere. In the demo, Personal Capital showed how easy it is to enroll a new bank accounts using deposit capture to grab a check image from that account. However, this enrollment option is not yet available in the production iPhone app (note 2, 3). Pricing: There is no word on pricing, but it looks like there may be a fee eventually. On the bottom of the pay screen it says, "Try Universal Checkbook FREE for three months!" Because Personal Capital offers basic PFM services ad- and fee-free, it will likely need fees for money movement, at least for users not committing any assets to the startup. 1. We took an in-depth look at truly virtual banks (Personal Capital, Bank Simple, and PerkStreet) in our Oct 2011 Online Banking Report. 2. The app doesn’t yet explain how to enroll new payment accounts, evidently the image capture capability is still in process. 3. Universal Checkbook has not yet been incorporated into Personal Capital’s iPad or desktop versions. Luckily, I ran into Jim Simpson, SVP IT at City Bank Texas, at Finovate Tuesday, or I might have missed his bank’s significant new app update this week. All three controls temporarily increase limits so customers can easily approve their own authorization exceptions (within limits). 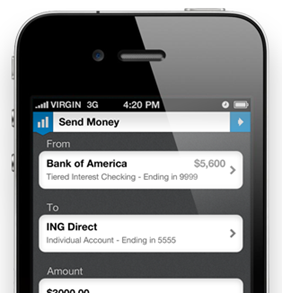 Bottom line: Putting more control into the customers’ hands is what mobile banking is all about. And City Bank has taken the lead. But they are just getting started. From what Jim told me this week, they have plenty of other ideas in the hopper. Keep an eye on these guys. Update 17 May: I neglected to mention that the software is from Austin, TX-based Malauzai Software. I love headline alliteration and it’s good to have a shtick, so I will periodically post a “Feature Friday” here. 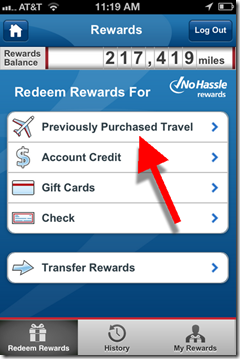 It turns out I started last Friday with Capital One’s new mobile rewards feature, the ability to trade rewards points to pay for PAST travel (and they did it without resorting to time travel). Finovate fan favorite PayNearMe launched a mobile version of its cash-based payment service that allows users to buy online then take the receipt to 7-11 to pay in cash (or card). Until now, the system relied on a printed receipt to hand over to the cashier. And printing is so 2009. The new mobile version (inset), does away with the printing, allowing users to show the cashier a barcode rendered on a mobile phone. From then on, the process is the same. 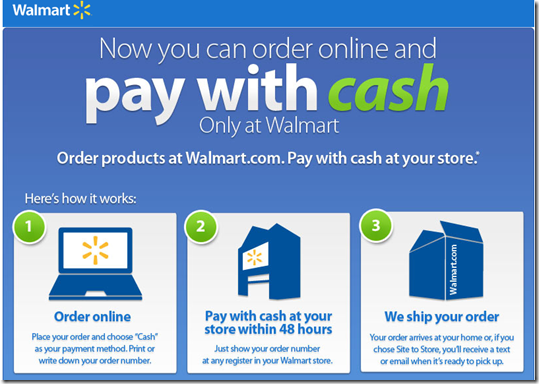 WalMart just launched a “pay with cash option” that works with its Walmart.com site (screenshots below). 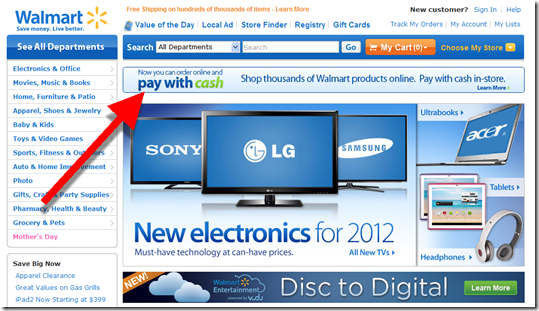 The company could extend the service to purchases at other ecommerce sites if it wants to drive more traffic to stores. Relevance for Netbankers: While we don’t spend much time here discussing cash, it’s still important across most demographics. And banks have a huge stake in the game with their ATM bases and other cash-handling infrastructure. Banks could do the same thing as PayNearMe, using their branch and ATM networks to take cash over the counter as payment. And many parents may prefer sending junior to the bank instead of the convenience store. But I also wonder if we’ll see the reverse? Instead of handing cash over to the 7-11 clerk, parents can transmit a bar code to their kid’s mobile to allow them to walk out of the store with a crisp $20 for lunch and a bus ride home. And it would make sense to extend that capability to mobile-enabled ATMs and even branches. Anyway, that’s all for this week, have a great one! Although it was one of the last major banks to launch an iPhone app, Capital One is now positioning itself to be a leader in mobile. Its April 5 iPhone app update included a new rewards function that’s the best I’ve seen. I thought this was some kind of typo when I first saw it in the marketing material. So I tested it myself this morning. And sure enough it does exactly what it says. 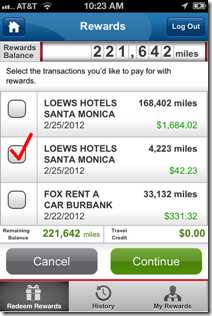 Previous travel purchases made on the Capital One card are displayed in the app. 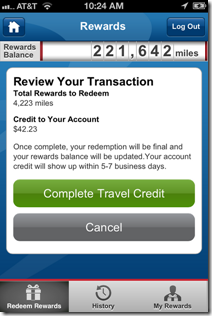 Users select the one(s) they want to redeem for mileage points and Capital One provides a statement credit to refund the user for the purchase. Brilliant! Note: Select a transaction (below left), confirm (below right). These are useful for customers who can’t or don’t want to log in. And of course, for prospects kicking the “mobile tires” at the bank.